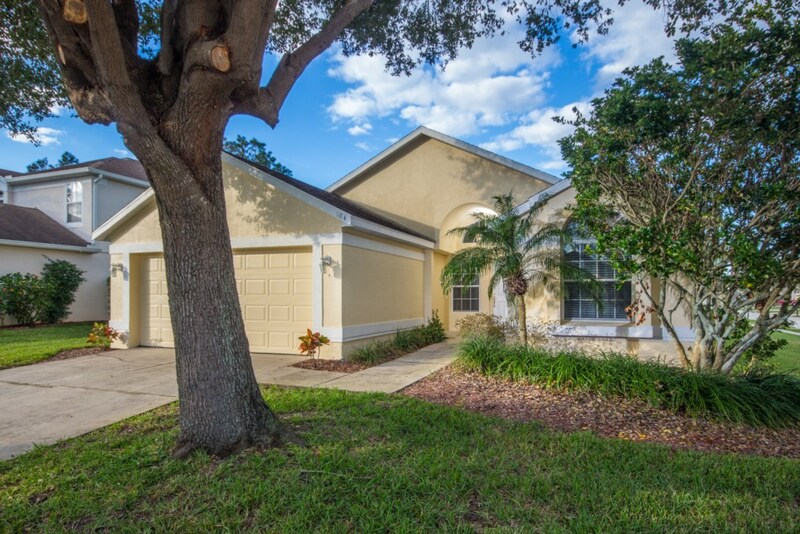 Have 6 people or less looking for somewhere that’s less than 10 miles from Disney and has a games room? Keep reading! 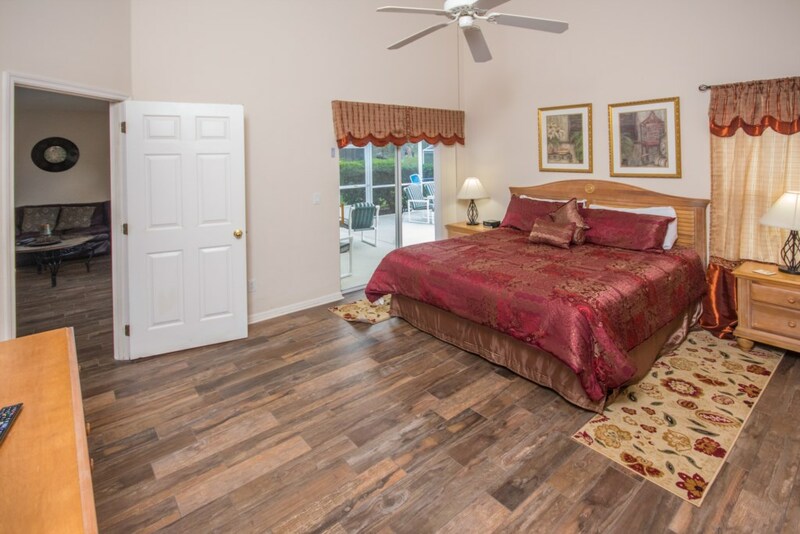 This vacation villa has 3 bedrooms, 2 bathrooms, sleeps up to 6 people, and has an awesome pool table. Let’s explore more of this villa. As you drive up to this villa, you’ll immediately notice the yellow wall color and the well-manicured front yard. 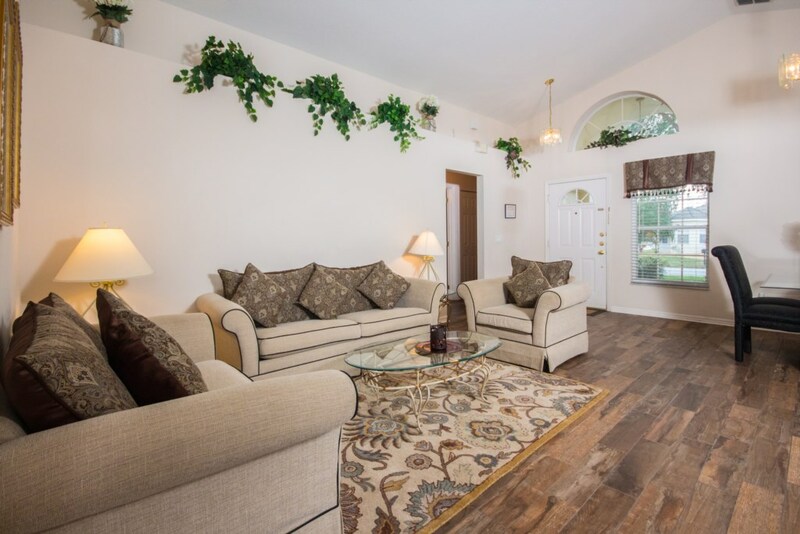 Walk into the villa, and the first thing you’ll notice is the wooden floors that run throughout (except bedrooms) and the tall, vaulted ceilings that give a sense of grandness to the room. 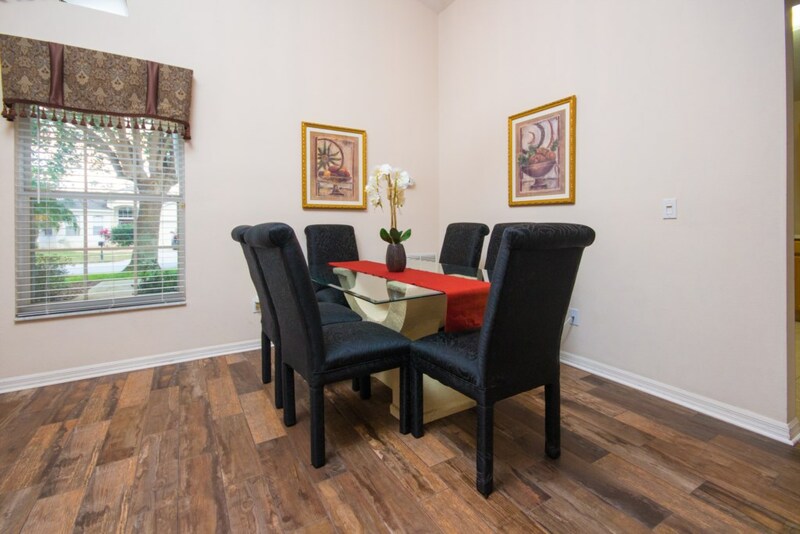 The first room you’ll come across is the dining room, which has enough seating to seat up to 6 people. 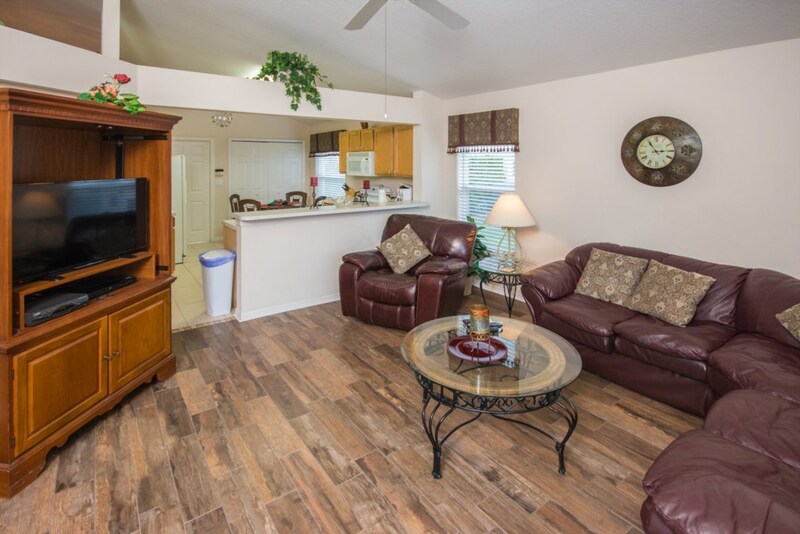 This is a great place for everyone to enjoy a nice meal together in the evening. To the right of the dining room is the formal living room, which has 2 crème sofas and a crème oversized armchair. This area is great to sit down and have deep conversation with others in quiet. 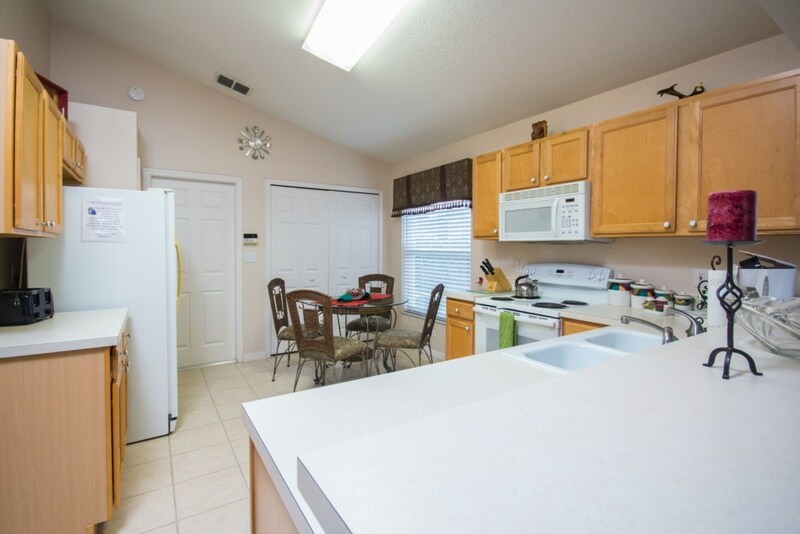 To the left is the kitchen. It’s a really good size and will please any chef. 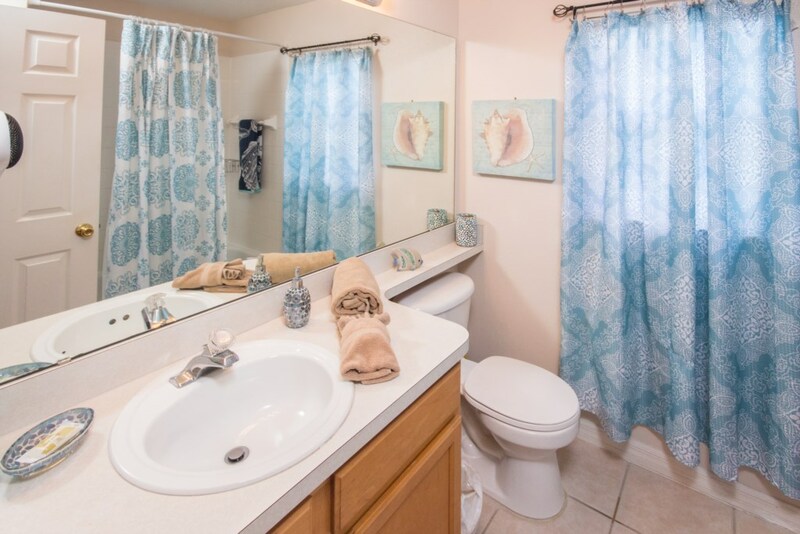 It comes fully equipped with everything you’d need to whip up something tasty to eat, has modern appliances, white countertops, and a small breakfast nook in the corner with seating for up to 4 people – a great place to enjoy breakfast. 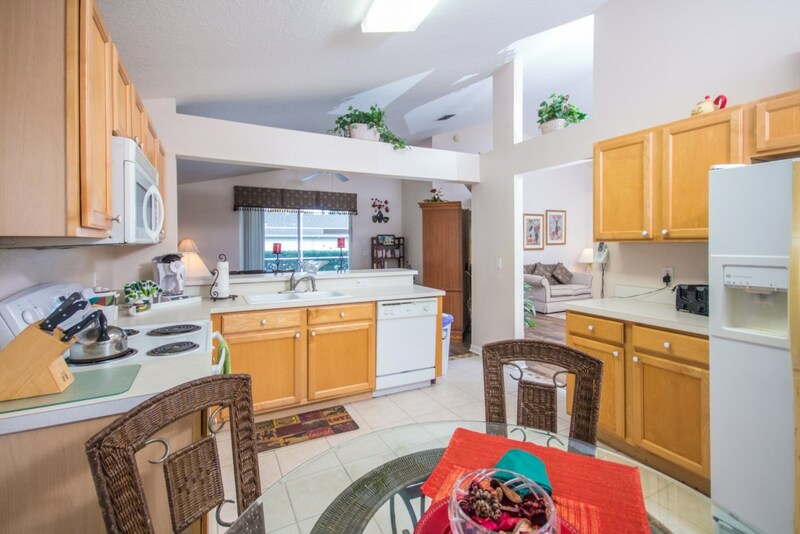 The kitchen also has a large opening that overlooks the living room. 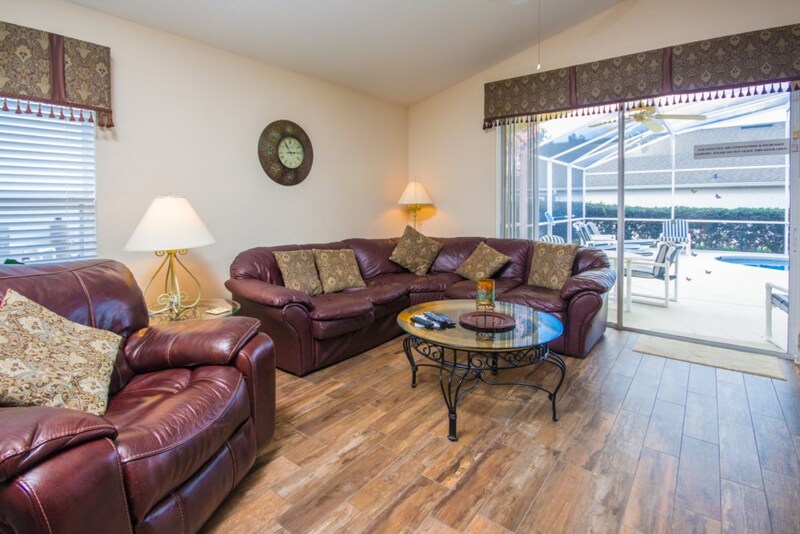 It has a large L-shaped brown leather sectional, leather recliner, a large flat screen TV inside the TV armoire, and access to the pool area via the glass patio door. 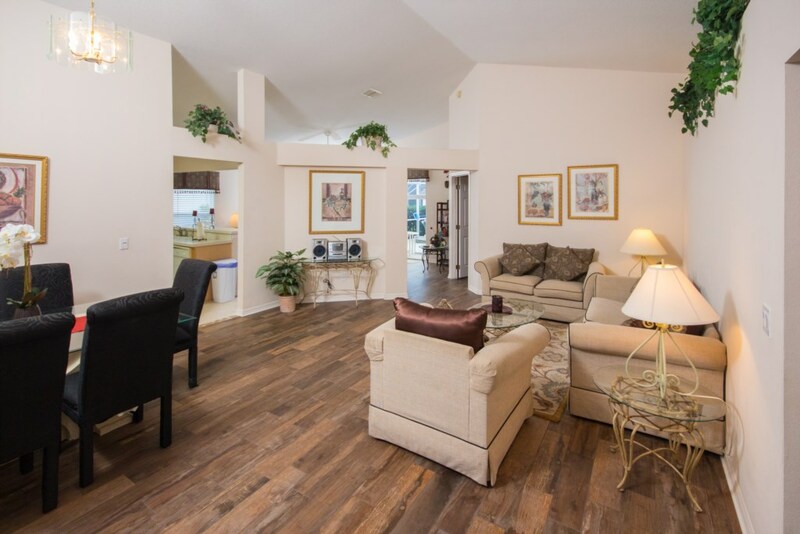 Walk through the patio door, and you’re in for a treat. The pool area is very large, and so is the lagoon-shaped pool. 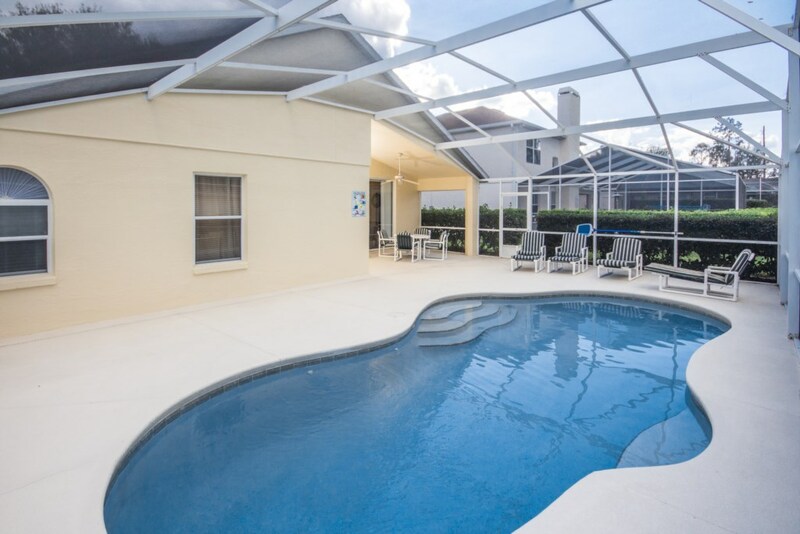 Take a dip in the pool to cool off from the Florida temperatures or lay back in a sun lounger and work on your tan. Want to be outside but out of the sun? 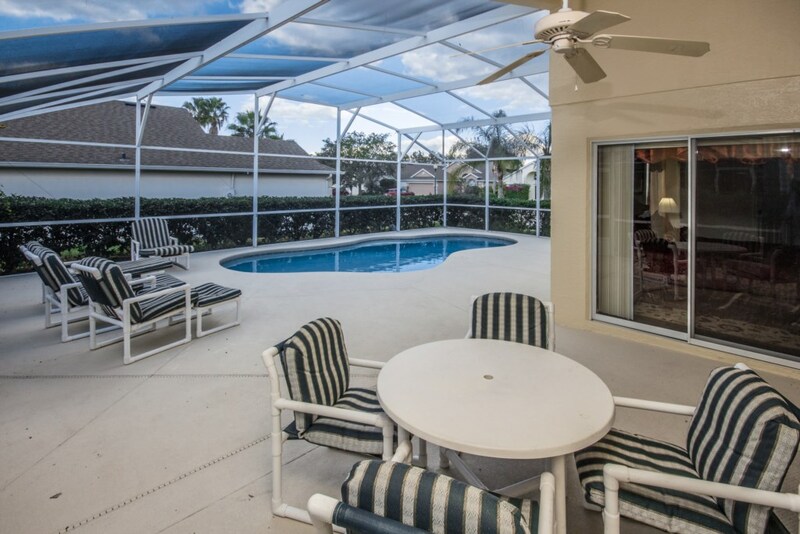 Retreat to the patio furniture under the covered lanai and enjoy an ice-cold drink. Want some indoor entertainment? 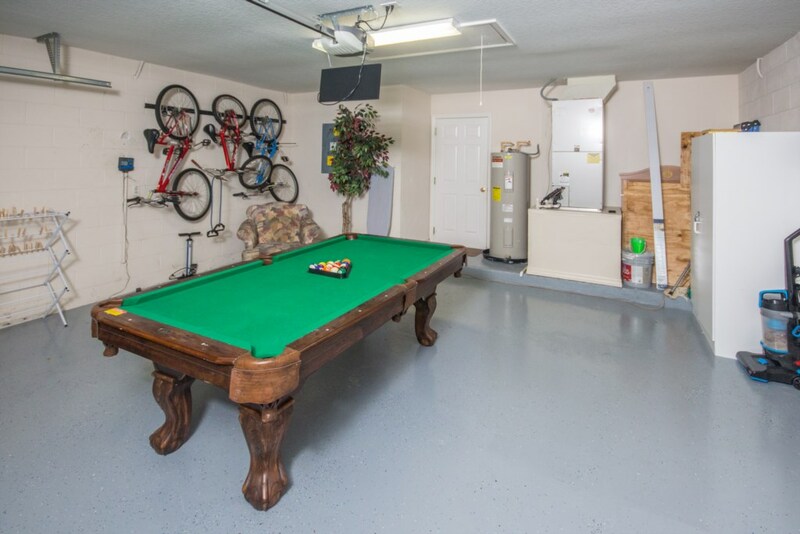 Head to the garage where you’ll find a full-size pool table! 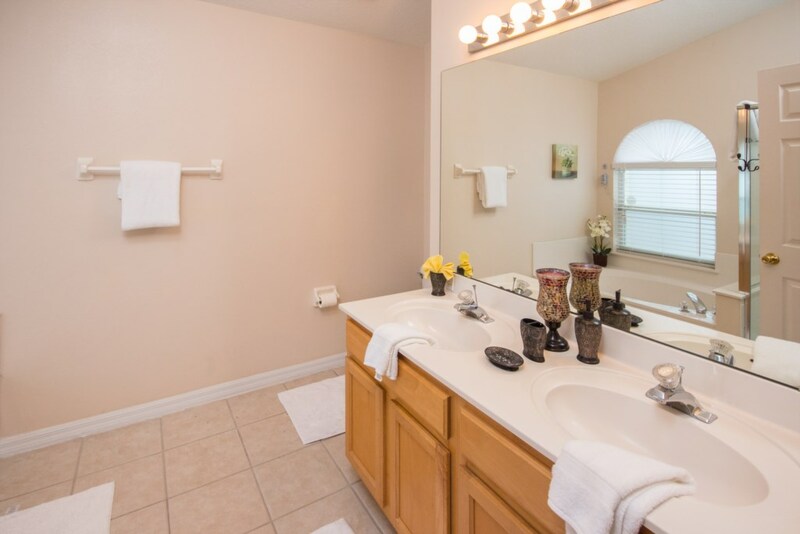 You’re sure to spend hours playing in the pool and on the pool table. 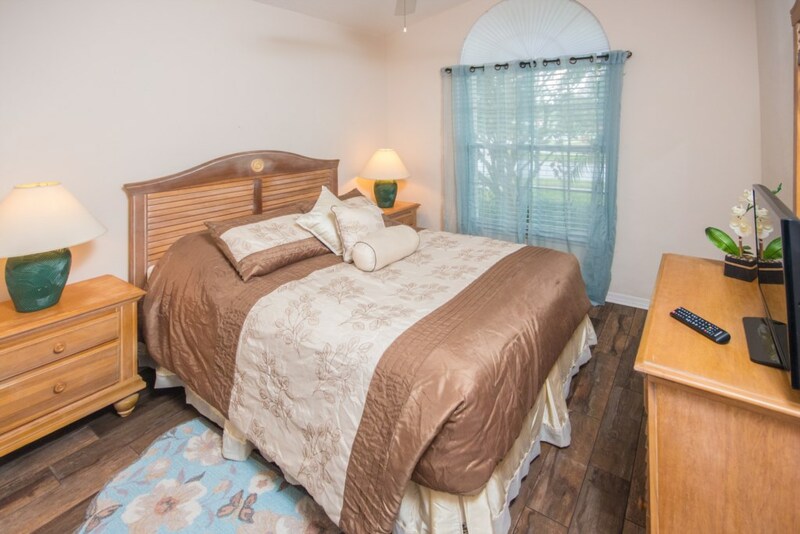 There are 3 bedrooms. 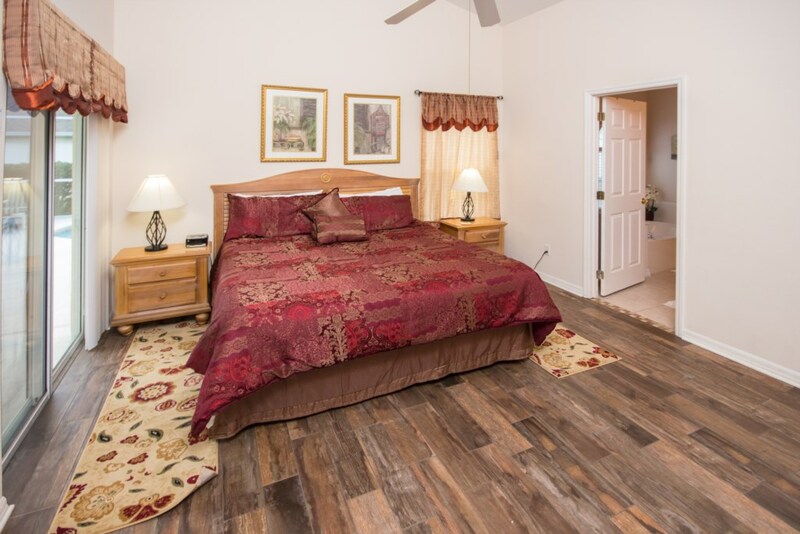 The first bedroom, the master bedroom, is large and has a king-size bed. 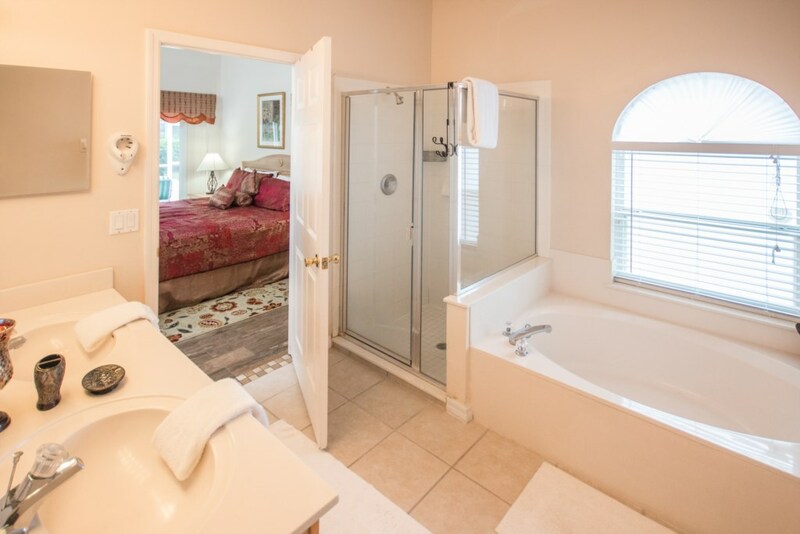 TV, private access to the pool, and an en-suite bathroom dual vanities, walk-in shower, and garden tub. 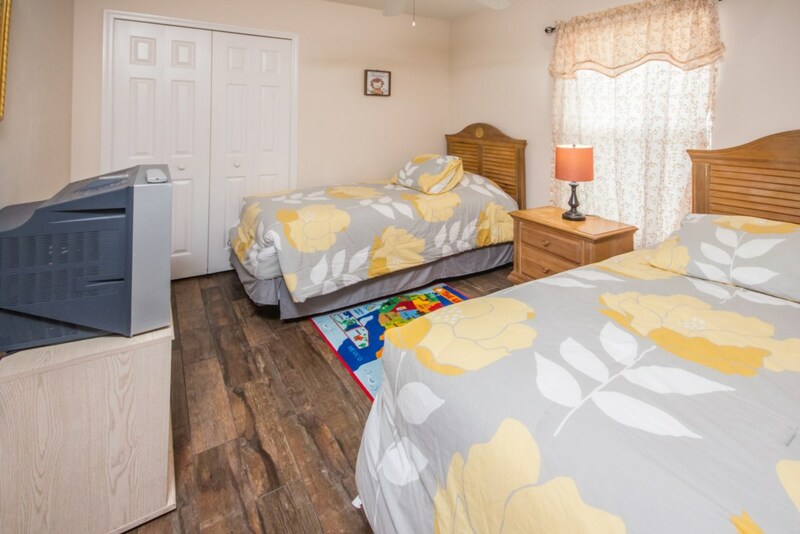 The second bedroom has a queen-size bed, and the third bedroom has two single beds, which are perfect for the younger members of the family.